​Rusty Smith is the Senior Pastor of Mikado Baptist Church in Macon, Georgia. Pastor Smith and his family began their ministry at Mikado in September of 2001 and have enjoyed the incredible blessings of God both numerically and spiritually during these years. Rusty and his wife Lisa have been married and have served in ministry together for 31 years. They have two children, Scott age 28 and Joy age 21. Scott is a youth pastor in Lakeland, Florida and serves along with his wife Abby. Joy is a senior at a Christian College. Previously, Rusty and Lisa served the Lord for over 14 years in the area of youth work where they were used of God as they invested their lives in the lives of teenagers. Rusty graduated from Tennessee Temple University in 1987 and majored in Pastoral studies. During his college years, Rusty was a summer evangelist with Neighborhood Bible Time, worked at the Wilds camp as a counselor, and served as student body chaplain. Rusty also has a Master of Arts in Ministry degree from Piedmont International University and an Honorary Doctorate degree from Pensacola Christian College. Pastor Smith has a private pilot’s license and enjoys golfing, and hunting. Price includes three meals, sessions, and activities. No overnight housing. PASTOR: If you bring 5+ men in your group you are invited free-of-charge. A great retreat is in store for you – all centered on the Word of God! 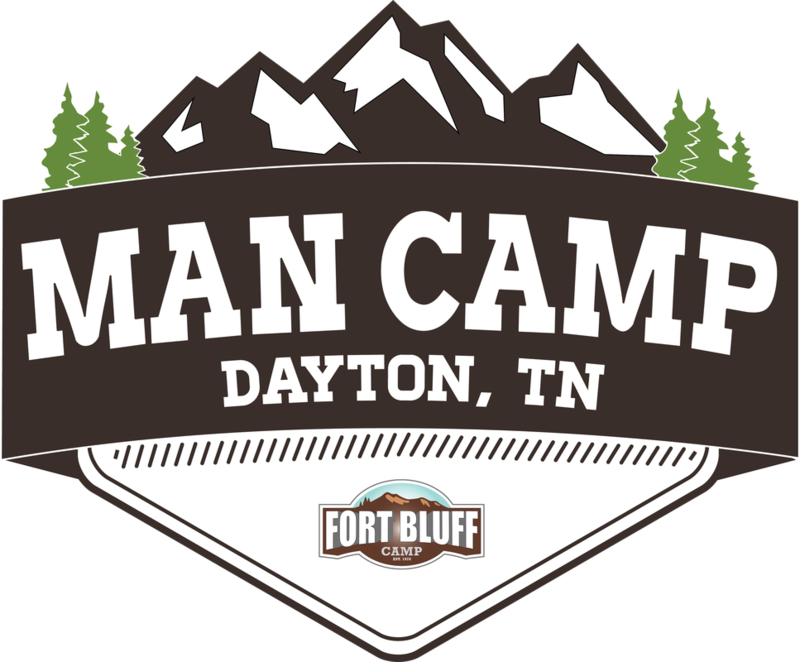 Do as little or as much as you want while here, but be sure to bring a hearty appetite for all the “man food” you will be served. On top of all that, the fellowship will give you the opportunity to re-connect with old friends and make new ones while here. ​Check-In is Friday at 5 pm in the office. However, you are welcome to come earlier that day if you want to play a round of golf (separate fees apply). Supper is at 6 pm. We are a tobacco, pet, and alcohol- free campus. All unloaded firearms are to be kept locked in your vehicle. From Nashville I-40 E, take the Highway 127 Exit in Crossville. Take 127 S into Pikeville. Follow signs to Highway 30 East. Take 30 East for 12 miles to State Road 443 West (Ogden Road). Big Camp sign on the corner. Turn right, drive one mile to the Fort Bluff Camp entrance on the left. From Knoxville I-40, take I-75 S to Exit #49 (Athens/Decatur). Turn right onto Highway 30 West and drive 28.5 miles into Dayton to the top of the mountain up to State Road 443 West (Ogden Road) - big camp sign on the corner. Turn left, drive one mile to the Fort Bluff Camp entrance on the left. 10:00 am Free Time – Tournament Time!